Whether you are interested in buying a good mens leather toiletry bag for yourself or you are buying one for a friend, I just wanted to say you`ve come to the right place! I have been a proud owner of AmeriLeather bag for a couple years and I honestly don`t know how I managed without it. It stores all the products I use on a daily basis – my face wash, sunscreen, lip balm and my trusty body lotion; I can also fit in my toothbrush and toothpaste. If you still don`t own one, I highly advise you buy it! But which one is the best? This is what we are here to find out! I am going to go over some of the most popular leather toiletry bags for men, group them based on their price and give you my top recommendations. Why Is Getting a Leather Toiletry Bag a Good Idea? 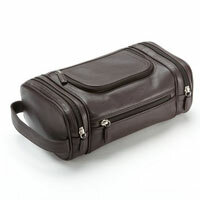 Men generally oppose the idea of owning a leather toiletry bag; some even go so far as thinking that owning one will make them feel less of a man. For those men, I have only three words – you are wrong. 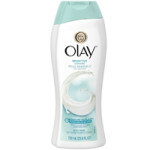 Staying at a friends house – I always try to only use products which are specially formulated for my skin type (oily); so, even though I could use some of my friends cosmetics, I`m not sure which products he uses. My toiletry bag helps me avoid confusion and potential problems and stay true to my skincare regime. Staying at my girlfriend`s – we all tried female skincare products at least once and, even though it felt good, there is a reason there are products specially formulated for male skin – male skin is thicker, has more collagen and secretes more oil. Which is why it is a good idea to have your body washes and lotions at hand. Traveling – the main function of any toiletry bag is organizing and storing your skincare products quickly and easily, and allowing you to take them with you wherever you go. Needless to say, they are indispensable when it comes to traveling! On the go – our lives are becoming increasingly hectic and we are constantly on the go; which is why we need to be able to take our skin care products with us and a good toiletry bag for man will give you just that! And, of course, I like using my bag even when I`m at home because I know where all my products are (I don`t have to run around the house like a mad man looking for a body wash, for example). 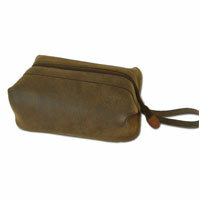 Leather is classier – toiletry bags with a cotton canvas look childish (at least to me). I imagine these bags being given to kids as birthday presents… Real leather is what real men use. 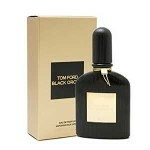 It classy, it looks, feels and smells good; and I love it! No chemicals – this may come as a surprise, but you should know that there are some purses and bags out there with an alarmingly high level of harmful chemicals, such as led. Leather, on the other hand, is natural and recyclable. Lasts longer – leather will outlast any other material, provided you take good care of it. The only “downside” of leather toiletry bags is the price. They are, on average, $10-20 more expensive than the ones with cotton canvas. 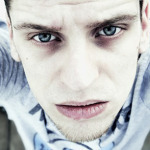 But if you want quality and style, you need to be prepared to spend a bit more money. 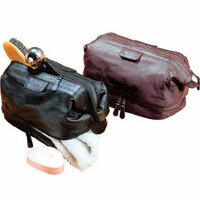 What Should You Have In Your Mens Toiletry Leather Bag? Well, there is no right or wrong here, and the answer will largely depend on the occasion. Short trips – if you are going on a short business trip or just paying a visit to one of your friends, you really don`t need a whole lot of stuff. In my toiletry bag I will have a toothbrush, small bottle of perfume, lip balm (Click Here to see our list of the best lip balms for men), maybe a bar soap (you can learn more about bar soaps for men here) and my face wash (you can see my favorite face washes here). 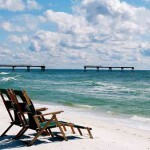 Long trips – if you are going on a vacation or on a longer business trip, you need to fill up your bag to the max! In addition to the items I listed above, I would add a good body wash, maybe even a body lotion and sunscreen. It depends on how long will you be away from home and how big your leather toiletry bag is. So, first of all, you need to be practical but you can also use your imagination. Product Reviews – Which Bag Is The Best? Since there are so many products available on the market, I decided to split them into few categories depending on the price. I have to be honest with you and say that this really is one of the best leather bags out there (even though it is one of the cheapest)! As you can see on the image, it is big enough to fit all your skincare products… and then some. As for the material, it is made of top grain cow leather and has a “doctor-bay style” opening. This style opening will allow easy access and when you unzip it, it will open way open! Other cool features are waterproof lining, so you can even place it under your sink and never fear about the inside of the bag getting wet, and a small leather handle, so you can hang it anywhere you want. This toiletry bag is good for both short and long trips! But that`s not all, I have one more surprise for you – the bag is (at the time of writing this article) on a cool discount, so act fast! This bag is a bit smaller than the previous one so it is best for shorter trips. It incorporates genuine leather as well as a more vintage design. As the name suggests, it is primarily made for grooming and storing your shaving accessories – it is packed with pockets and pouches. I already said that the bag is a bit smaller, but it is compact and full of various compartments, this will help you organize your things easily. 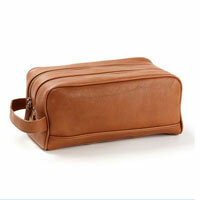 Last, but certainly not the least in this “under $50” group, is Bellemonde travel vintage style mens toiletry bag! What’s unique about this bag is its simplicity. You get one huge compartment encased in brown faux scotch grain letter. This bag is simple, down-to-earth and rugged, and I like it! It is 12 inches long (30.5cm), 7 inches wide (18cm) and 4 inches deep (10cm), so you can store pretty much everything, even a small towel. It is also easy to clean using only soap and water. The size makes it suitable for both long and short trips. 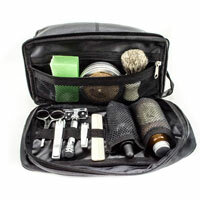 Let`s kick things off with Winn Harness toiletry bag for men! It is made of good quality leather and lining is robust and sturdy enough to last you years! It is 9.5 inches wide (24cm) allowing you to store your skincare products in larger packages. Top zip compartment is wire framed; this frame will help you open it more widely so you can store your products with ease. This bag is great for longer and shorter trips. This bag also features a wet pocket on the bottom and a side zipper pocket. All in all, this is a good bag and it is currently on an awesome discount! 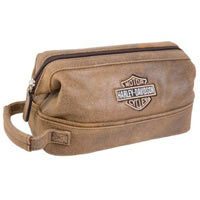 This is a high quality, simply made, classic toiletry bag. The makers of this bag wanted something practical, but classy at the same time, and I have to say they`ve done it. With this bag, you will get a spacious interior, smooth exterior made from superb quality leather (which is easy to clean) and a side compartment with a zippered pocket (to store smaller stuff) and a well-known Nike badge! Perfect for long and short travels and bragging to your friends. Here is a special treat for all you HD lovers out there! First of all, I`d like to point out that this bag is not only pricier just because it features a Harley Davidson logo, the bag itself is of high quality, made from top grain leather! The zipper is robust with extra large pullers to last you many years. As for the inside of the bag, there is one zipper pocket and three side ones to store and organize your small grooming tools better. There is also a side handle made of leather for easy gripping and hanging. You can use it for longer and shorter travels. I have to say I am not a huge fan of toiletry bags with a ton of little pockets and compartments, but I`m sure there are some of you who like them, and this is why I will be talking about this bag next. Two side pockets – these are also small, and you can use them to fit your lip balm, smaller skincare containers, nail clippers etc. All the pockets have nylon interior to prevent the accidental leakage. It is also perfect for longer and shorter trips. This bag features a slightly different design that the previous models – double zip at the top for two separated large compartments. The lining is, of course, water resistant. This toiletry bag is one of the classier ones, large enough to fit all your skincare products but compact enough to fit in any suitcase you might have. It also has a leather handle and large, leather zipper pulls. All in all, this is a top notch bag and it certainly lives up to its price. Thanks for stopping by and leaving a comment. 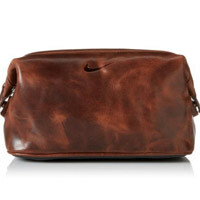 I have to agree with you and say that the “Nike” bag looks amazing but you still made a great choice going for AmeriLeather, this is one solid leather toiletry bag, considering its low price.